LONDON--(BUSINESS WIRE)--The global thoracic catheters market 2019-2023 is expected to post a CAGR of 6% during the forecast period, according to the latest market research report by Technavio. Minimally invasive surgeries are economical, require smaller incisions, and have faster recovery times. Minimally invasive video-assisted thoracic surgery (VATS) offers a shorter duration of pleural drainage using indwelling thoracic catheters with reduced morbidity rate when compared to conventional surgical procedures. As a result, patients are highly preferring minimally invasive surgeries. This is expected to increase the demand for thoracic centers globally. The increased preference toward minimally invasive surgeries by patients will drive the growth of the global thoracic catheters market during the forecast period. This market research report on the global thoracic catheters market 2019-2023 also provides an analysis of the most important trends expected to impact the market outlook during the forecast period. In this report, Technavio highlights the growing adoption of single-use catheters and self-catheterization as one of the key emerging trends in the global thoracic catheters market. There is an increase in demand for single-use catheters and self-catheterization as they lower short and long-term complications during intermittent catheterization. Single-use catheters are extensively used in hospitals to avoid infections. In self-catheterization, disposable thoracic catheters are used to reduce the risk of infections. For instance, BD’s PleurX drainage system allows patients to manage symptoms through intermittent drainages at home. The tunneled chamber and vacuum drainage bottles in the system drain the fluid build-up in the pleural sac. The trend toward adopting single-use catheters and self-catheterization is gaining popularity and will positively boost the growth of the global thoracic catheters market. “Vendors are focusing on developing advanced thoracic catheters to expand their presence globally. Medela’s Thopaz+ Digital Drainage and Monitoring System allows complete patient mobility during fluid drainage with shorter hospital stays. Getinge AB’s Atrium Oasis Dry Suction Water Seal Chest Drain can determine air leaks and intrathoracic pressure with high contrast blue water and easy-to-use feature. Many players in the market are constantly improving their products and technologies to stay ahead in the competitive market. This will impact the market’s growth positively”, says an analyst at Technavio. This market report segments the global thoracic catheters market by product (accessories and catheters), application (pleural effusion, pneumothorax, and others) and geography (APAC, Europe, North America, and ROW). North America led the market in 2018 with a market share of over 38%, followed by Europe, APAC, and ROW respectively. The dominance of North America can be attributed to the presence of extensive health insurance coverage, the increasing R&D expenditure by vendors, and the high adoption of technologically advanced products. 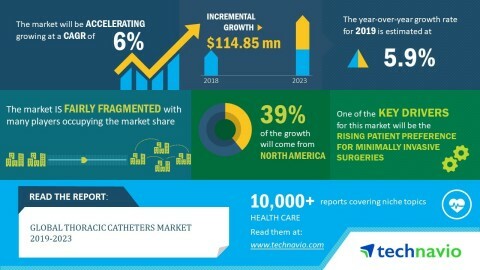 The global thoracic catheters market 2019-2023 is expected to post a CAGR of 6% during the forecast period, according to Technavio.